The photo was taken minutes after my brother's family arrived from Davao. 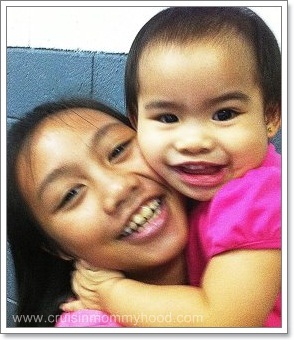 Julia couldn't stop hugging her cousin, Erika. We look forward to their visit every summer. You see, my parents live in Davao City and my brother and his family live right next to our parents house. They visit us or we visit them every year and my heart is just filled with joy every time I am with them. Don always tells me that he is envious of my family's relationship with each other. We are a close-knit family. My father has three brothers and 3 sisters while my mother has 2 sisters. They don't have that "in-law" concept because my parents grew up as neighbors in Jaro, Iloilo. Our family gatherings are always fun and memorable. Three of my dad's siblings live near our house and they are Don and I's support system. Well, support system means making my life a whole lot easier and better. I remember my uncle fighting with our crazy neighbor who was responsible for the SEVEN nails found on each of my FOUR car tires. Just recently, my aunt's husband argued with the guy from Meralco who was about to cut our line and rode his bike to the nearest office to pay for our electricity bill (Yes, I forgot to pay our electricity bill!). I don't know what I'll do if they are not around. They are our ever-reliable damage controllers (Haha!). We are as close to our relatives from other cities in the Philippines and other countries. The distance is not a reason not to keep in touch. We want Julia to grow up surrounded by love from our family AND extended family. 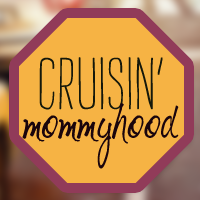 Tomorrow, Cruisin' Mommyhood is a guest at Dainty Mom. I will share practical tips on how to strengthen our relationship with our "long distance" relatives. 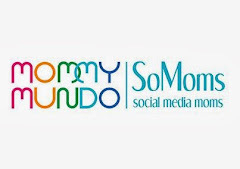 Our little ways to keep in touch and stay close worked for us and hopefully it will work for your family too.